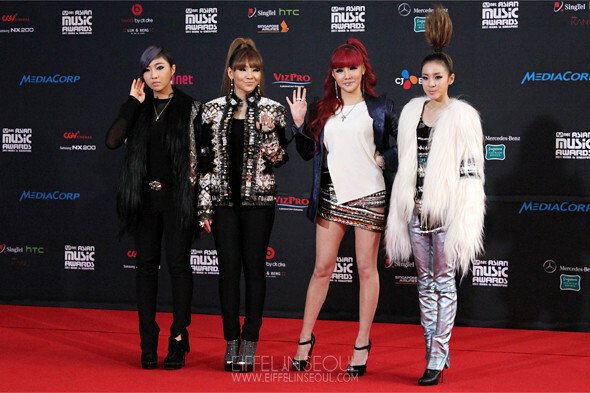 It was pretty clear that black was the color trend at the 2011 Mnet Asian Music Awards. Whether its gowns, 'LBD' or a semi-suit sported by Kang Sora, i'ts evident the color was a favorite. Han Chae Young (한채영) wore the best black dress on the red carpet from Dolce & Gabbana, the sequin shines on the red carpet. It was a show stopper. Yoon Eun Hye (윤은혜) came closely wearing a Versace Fall/Winter 2011 dress with a high slit and cut-out at the back. Baek Ji Young (백지영) and Yoon Seung Ah (윤승아) both opted for plain black dresses which was not as memorable as others. Japanese singer, Koda Kumi (倖田 來未) opted for a tiered black dress with a plunging neck line. She wore the brightest and widest smile on the red carpet and the best accessories on the red carpet. Seo In Young (서인영), HyunA (김현아) and Jane Zhang (张靓颖) all wore the 'Little Black Dress'. They were also seen wearing Christian Louboutin heels. Kang Sora (강소라) had the most boring outfit of everyone. She opted for a black ensemble with black leather boots. Han Hyo Joo (한효주) was also on my best dressed list. Wearing a lovely cream/white dress with rose open-toe pumps. She also wore a sweet smile. Although Fann Wong (范文芳) and Kit Chan (陈洁仪) did not walked the red carpet, I think they deserve a spot here. Both their outfits were clearly much more interesting than Kang Sora (강소라)'s. Park Si Yeon (박시연), Kim Min Hee (김민희) and Kim Hee Sun (김희선) opted to wear colors on the red carpet. They were also on my best dress list, each standing out on their own. How many times have Nam Gyuri (남규리) wore a bridal gown on the red carpet? I've lost count. Search 'Nam Gyuri Red Carpet' on Google and you can easily see her bridal choices on the red carpet. For the idol groups, both 2NE1 and Girls' Generation were very well dressed. I did enjoy seeing them on the red carpet but there were way too much details for both groups. They each shine on their own, pretty blinding as a whole. Awarded the 'Best New Female Artist', A Pink were all dressed in little white dresses. Miss A was the first to arrive on the red carpet with Chinese actor/singer, Vision Wei (魏晨). While I love the prints on their outfits, Vision Wei (魏晨) took the limelight away from them.